We’ve all dreamt of that fantasy 10 foot walk-in wardrobe and the Hollywood-style dressing room with space for hundreds of handbags, shoes, and accessories. However, we’ve slowly come to realise that being drowned by our wardrobe isn’t necessarily a good thing – especially as a mountain of clothes doesn’t actually guarantee style, as proven by some of the most stylish women we know who have shockingly few clothes. True story. But how can that be, we hear you cry. Style doesn’t come from the amount of clothing you own, rather it comes from what you do with it. It’s all about working with what you have, and making sure it suits you at the same time. In other words, think capsule wardrobe that ticks all the boxes in every combination and for every occasion imaginable. Too many clothes, nothing to wear? 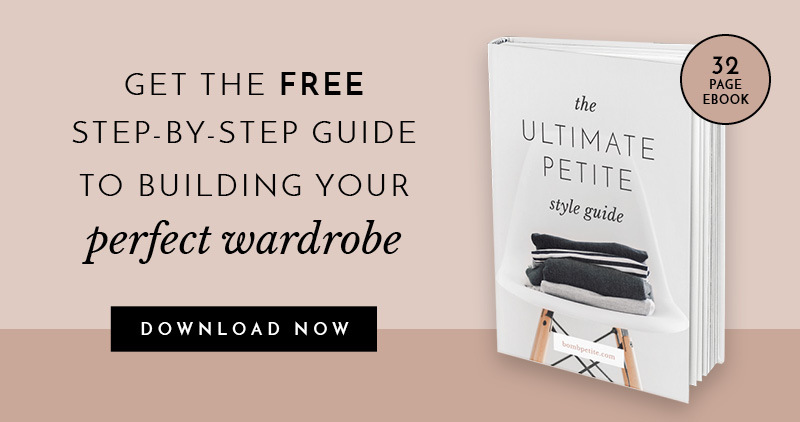 Download our free style guide here. Smart shopping has long been associated with the French, and anyone who you regard to be a true style maven is guaranteed to shop the same way too. Mindlessly adding something to your basket, regardless of how chic you think it might look on the model or the clothes hanger, is a big no no. Instead, take time to assess your current wardrobe and find out what is missing. Then, and only then, will you truly be ready to fill the gaps and hit the shops. Buying the staples and the basics is a great way to start, and slowly add those wow pieces as and when you need them. Style is about expressing yourself through your clothes and accessories, and making each piece work with another. With a limited number of clothes, you want to make sure your outfits reflect who you are. Once you find your own identity, you can slowly learn about expressing yourself through your outfits. Perhaps your shy personality has you reaching for understated styles in pastel colours? Or perhaps you love being loud in all aspects of life, and clashing prints and bold block colours are what you reach for? Learn about who you are and what you love, and your wardrobe should soon follow! As much as we love flicking through the pages of the Fashion Bible, we know that the statuesque models of Vogue aren’t the best style role models to have. Instead, we love looking at our favourite petite women who really make petite clothing work for them. From the pint sized Eva Longoria to Michelle Williams to even Lady Gaga (sans meat dress, naturally) we’ve found a great deal of petite style inspiration. Pinterest and Instagram are great places to find sartorial inspiration, especially as it lets us filter our searches to petite clothing and only petite clothing. Buying fewer clothes of good quality that fit well will save you money in the long run; and ensure you come out on top in the style stakes too! Cheap clothes are cheap for a reason. The two biggest costs of making a garment are the fabric and the labour. To reduce the cost, you push one or both of those down. Manufacturers lower labour costs by cutting corners on garment construction to churn out more clothes so they rarely last for long. That being said, a higher price tag doesn’t necessarily indicate quality, so do your research. Find the brands that suit your style and budget, and if needed, spend a bit more on tailoring with the guarantee that it’s going to fit you like a glove and complement everything flawlessly. After a lot of hard work, sleepless nights and endless cups of coffee, we’ve finally launched our much-requested bespoke service. We’re now able to offer our fabulous, petite fashionistas an utterly unique service which will guarantee the perfect fit every single time. The option for petite bespoke clothes adds a whole new dimension to our wardrobe. It gives us the chance to start afresh, choose quality over quantity, and give our style that much needed overhaul once and for all.